Find a green cleaning product, the easy way. I love, LOVE when other people vet things and make life easier for me. It’s important to trust the source doing the vetting, and I do look through the process to make sure it sounds reasonable and not like they are skimming or manipulating data. Last week the Environmental Working Group released its new online Guide to Healthy Cleaning. They are known for their database on skincare products already and this time their scientists tackled products that claim to be chemical free, non-toxic, natural, and their non-organic counterparts. Due to yet another US regulation gap, home cleaning products are NOT required to list any ingredients harmful or otherwise on their labels (disgusting right). OSHA only regulates workplace products, so while you may see ingredients on the back of some spray bottles you have at home, these are entirely voluntary and many companies leave out a few things they aren’t proud of! For instance, formaldehyde which is a known carcinogen and illegal in Europe is found in 409. Way to go USA. EWG’s scientists went to work and spent 14 months doing a deep dive into over 2,000 products and assessing them against both national and international toxicity data sources. The full process of their research is described here. Seventh Generation, Dr. Bronner, and Green Shield. Every product from Whole Foods brand was an A or a B and Mrs. Meyer’s got Bs across the board. BabyGanics, Simple Green, Tide, Gain, Downy, All, Green Works dish soap, Method dish soap, Palmolive, Cascade, and a host of others. Check out EWG’s full list to see where your products rank. 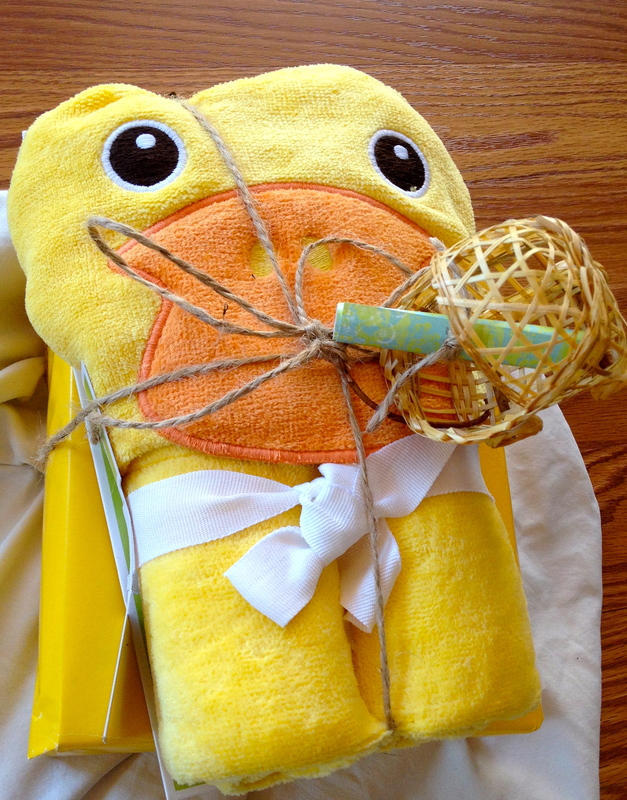 Perhaps an eco baby gift? Things started off good; I found a Burt’s Bees Baby Bee set while at Target. I’ve been iffy on Burt’s since they were bought by Clorox, but still use a few of their products with positive GoodGuide ratings. This set contained no parabens, no fragrances, no sulfates, no phthalates, no petrochemicals. It was certified cruelty-free AND the tray was made from potato starch and the box is 60% post-consumer content. It also seemed to contain all of those things you need for a baby (diaper cream, baby shampoo, you know). I was feeling pretty good until I took a tour down the baby clothing isle and ended up with this adorable duck face baby towel. I probably should have bought a similar organic cotton version online (if I was being truly eco) but the thing was so damn cute. I made up for it by then heading to my new favorite reuse center SCRAP. I LOVE this place. It only sells reused crafty things and it also is a non-profit that focuses on getting art donations to low-income schools and teachers. 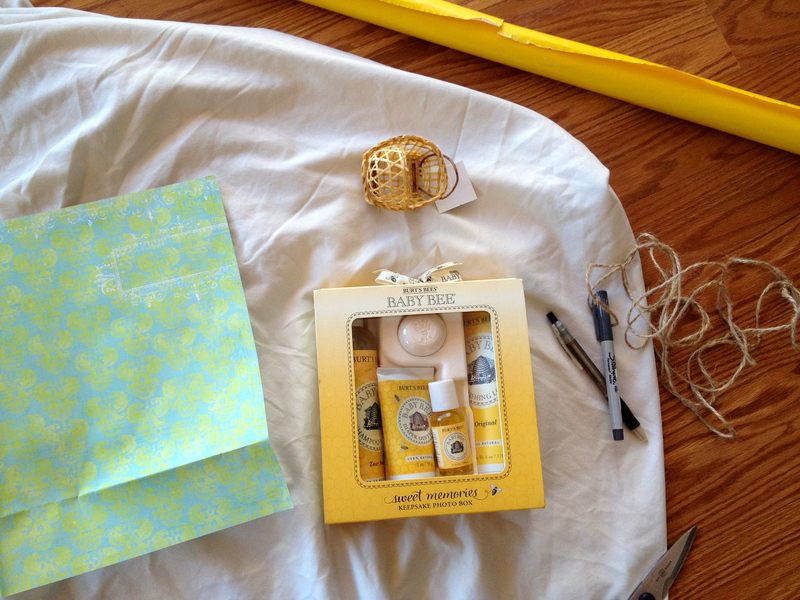 I browsed around and found half a roll of yellow wrapping paper and a cute wicker baby carriage (I also bought a hurricane candle holder, several items to make a jewelry board, another basket, and a hangy thing with hooks and the total was $6). I got home, wrapped everything together with some twine that was once on a present of mine, made a card out of recycled paper (scroll style, sweet right), and felt pretty smug about myself. That was until I spent an hour researching D–Limonene. I figured I should check GoodGuide before I actually gave them the present, and while most of the BB products I use score an 8 in health, several of the items in the Baby Bee box were at a 4 (environment and social categories were high so overall scores were 6). Crap. The reason was the same in each category: D-Limonene, a completely natural ingredient found in lemons (which is why I hate that meaningless word natural!). I read EPA reports, Scorecard summaries, and in my opinion the research is sketchy and it seems pretty harmless. It hasn’t really been proven to do anything bad. And, many doctors and naturopaths recommended ingesting it for cancer prevention, as a digestive aid, and to treat gallstones. It’s found in almost every food that has a citrus flavor (gum, pudding, OJ) and the EPA classifies it as low-toxicity. The best summary article can be found here. I still gave Leah the present and will let her make the choice on whether to return it, but I did mentally kick myself for not pulling out the GoodGuide app at Target and figuring all of this out before purchasing it. I think this also just goes to show that no matter how hard you try, you very often will not get it all right. I’m in love with our new table. People seem to think that the eco-friendly option is always the more expensive one. I’m sure this stems from years ago when anything organic or Fair Trade was 50% more (side note market demand is starting to really even some things out!). One eco-friendly item that isn’t more expensive than its regular counterpart: our fabulous new kitchen table. I was strolling through SF’s Indie-mart, a mecca for the local/eco minded, and came across J and his shop The Dirt Floor Studio. My breath caught as I slid my fingers across a reddish-brown farm table with dark knots, wide beams, exposed screw heads, and bench seats. I fell in love, but it looked like something I could never afford. I have a phobia of talking to any sales-type person if I know I can’t buy what they’re selling. However, for this table, I pushed my limits. We didn’t talk dollars. 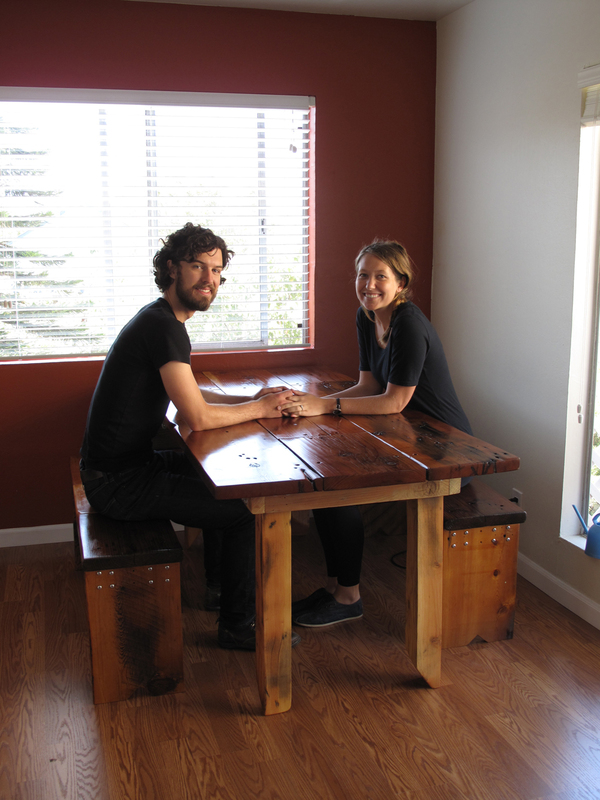 We talked reclaimed wood, reuse, and how he could make something to fit any budget. (Any budget I thought? Even a recent grad student’s?!). I took his card. He seemed so nice and honest that I found myself working up the nerve to call him a few days later. I paced around the apartment waiting for dollar signs that would crush my dream of owning this or a similar table. I researched similar reclaimed tables at Pottery Barn and at antique stores and the prices for one bench SEAT started at $549 (the same size table at Pottery Barn would have been $2200). Our budget was about $600, crap. I panicked as I told him this over the phone, but all I heard was ‘ok, I can work with that.’ YES! 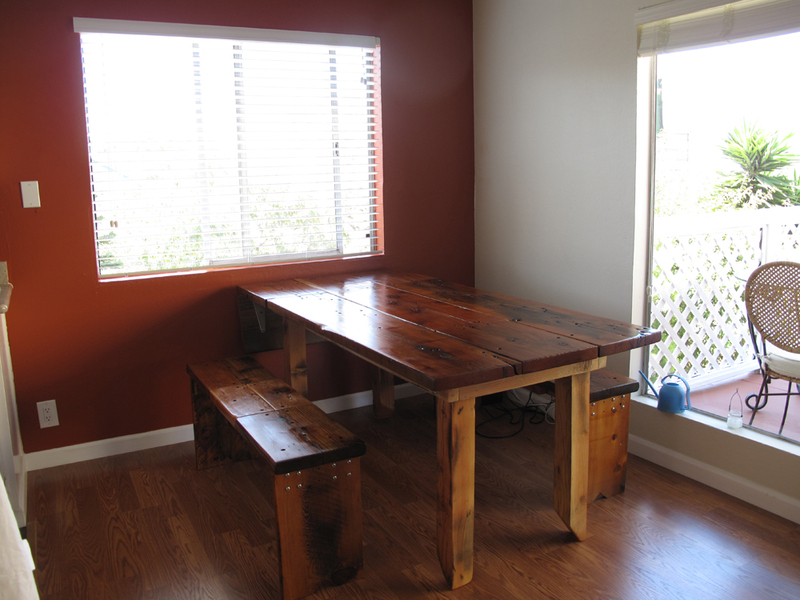 We chatted further – he could get less fancy reclaimed wood and joinery; there is a way. We had another phone call and a few emails as I saw pictures of his work and pointed out things I liked. This all led straight back to the original table I saw. After one of our chats, J told me he would sell us THE farm table for $700 with the two benches included. He also lowered the table and expanded the benches for no additional cost to fit with our space and the style we had in mind. Less than a week later, we had this gorgeous piece of art to light up our living room. The wood came from an old barn in Nevada, he built it by hand, and though ours has a polyurethane seal because it is a soft wood, many of his tables instead are finished with a hot linseed oil soak, multiple rubs of Tung oil with a beeswax top rub. So, buy local, buy reused, chat with the artist. The result can be incredibly unique. Thanks to those of you who participated in the giveaway by posting on facebook, sending me emails, tweeting at me and leaving a comment. It was so much fun to read all the green you’ll be up to this month! I truly loved each goal but picked two winners that will benefit specifically from having PeopleTowels. I also picked these two because their September green is easy to turn into long-term green. The first winner is Pupfiction who is committing to kick her paper towel habit! With a toddler at home, I’m sure paper towels seem crucial and hope PTs are just the thing to help! Our second winner is Kristin, who will find PTs useful at work. Her office has tons of paper towel and napkin waste (living in San Fran I forget that not every city has office composting!) and these reusable gems will help keep her hands clean and dry and her garbage can empty. Ladies, please let us know if these PTs come in handy! Honorable mention goes out to Dave who is only going to eat only organic veggies – love that you’ll be pesticide free! 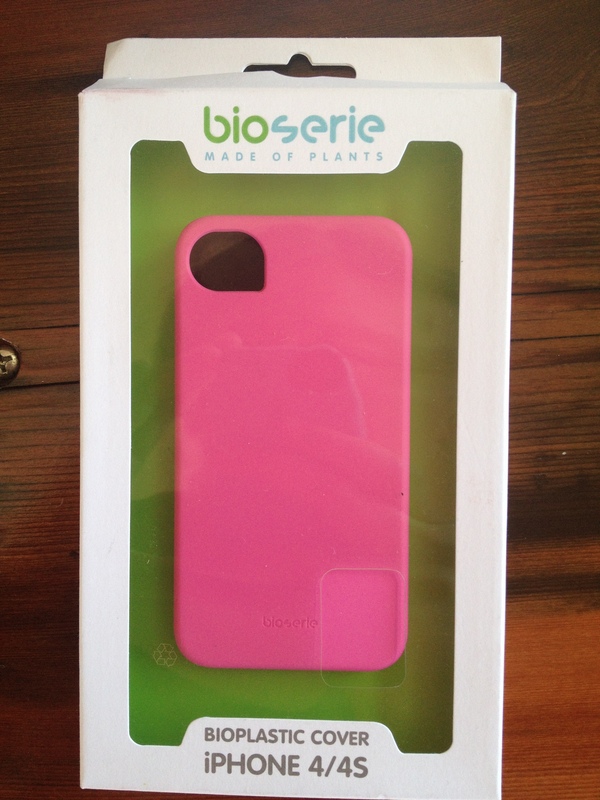 Thanks again to everyone who entered, next month I’ll be giving a way a Bioserie compostable iPhone cover (in PINK! )!